As featured on “The World´s Most Extreme Homes,” the beautiful Mount Hartman Bay Estate rests next to the water´s edge on its own private peninsula looking across the crystal blue waters to Mount Hartman Nature Reserve. Villa seems an inaccurate description of this incredible piece of rustic architecture. Overlooking the Aspen Highlands, this 10,000 sq. ft. property features endless luxury amenities as well as having a private waterfall! Experience the high life at the magnificent Carlton Penthouse located in St. Moritz. It’s difficult to imagine anything better than the waking up to a view like this one! This slope-side beauty homes up to fifteen for a taste of true luxury. Predictably, this includes an indoor swimming pool, hot tub, fitness room, and massage room. As if that wasn’t enough, this property comes with a home cinema suite. This is the don of all ski chalets! Expect an indoor pool, spa and gym, high tech audio and video equipment and a perdonal chauffeur. This is all situated only fifty meters from the piste! OK, so time to wake up, stop the day dreaming, back to reality. Us mere mortals are most likely never going to earn that much in a lifetime, let alone spend it on a holiday. However, there’s no need to be down about it, there’s some pretty darn good value accommodation here at Small Brook Cottage and we think it’s luxurious in its own quirky way! As you’ve probably gathered by now, we’re undertaking a bit of a challenge, creating our perfect cottage in Hay. Friends and family, intrigued and curious, keep on asking for updates on our ‘project’. I can’t help but to find the word project slightly terrifying. Maybe it’s from school days, when the year would end with some giant assessment disguised as one. Or perhaps it’s from being glued to the endless reruns of Grand Designs on Channel 4. You know the ones, the happy young couple with the best intentions who end up with a mortgage the size of an Airbus A380 and restraining orders against each other. Hay Does Vintage returns for another year. Bigger, more tempting, and even more vintage. Town of Temptation begins June 30th, and is an event not to be missed. Hay Does Vintage returns to Hay-on-Wye with an even bigger vintage event, ‘Town of Temptation’ on Sunday 30th June. This time Hay Does Vintage will be taking place in four separate venues, a marquee in the Market Square, the Buttermarket, St John’s Place and the Parish Hall all within a short walk around Hay. Jo and Naomi, the founders, are also keen for people to appreciate the huge choice of antique and vintage shops that the town has to offer. ‘Hay has been quietly building itself a reputation as a centre for vintage excellence for some time and we want to highlight that to a wider audience in a fun and light-hearted way’ says Naomi. Apart from encouraging visitors to wander between the four venues, aided with their ‘Town of Temptation’ map, there will be an interactive fashion show with models in charity sourced vintage clothes styled by Hay Does Vintage intern and local fashion student Lucy Scott. 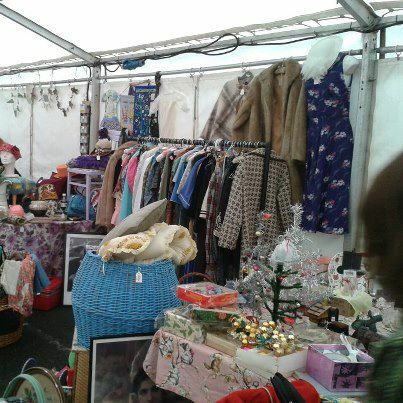 Like last year, the charity shops will be open on the Sunday and reserving their vintage stock to sell on the day. Makeup artist and co-organiser Naomi, of Naomi Emmanuelle Makeup, will be on hand to provide vintage makeovers with others providing vintage inspired hairstyling and manicures in the new ‘Pamper Lounge’ upstairs at St Johns Place. Next event 1st December. Watch this space. Looking out across the globe field, it seems an odd thought that less than three weeks ago it was abuzz with activity. People sitting, people dancing, people thinking; it was truly a wonderful gathering of people. I was delighted to receive some fantastic feedback from friends and family, all attesting to the success of the festival. Whilst many will rave about the heated debates they witnessed and others will lament about the electrifying band the previous night, one thing crops up time and time again and that’s the atmosphere. Whilst I don’t think there is any intention behind it, HTLGI seems to somehow mirror the town of Hay itself. All of the wonderful characteristics of our town are just as true of the festival. It’s small but intense; it’s daring yet modest and it’s got quirks and curiosities in abundance. It’s independent, driven by ethics and has a cracking sense of community. One of the key aims of HTLGI is to create a space where big ideas have no boundaries and are not constricted to a programme of events. Whilst this sounds like an unreachable goal, my insatiable habit of eavesdropping discovered results to the contrary. I so enjoyed walking through the site and watching attendees gathered in conversation, gesticulating wildly, challenging each others’ ideas and preconceptions. Whilst I dabbled in the philosophy of it all, the musical treats were definitely my highlight. I spent much of my time at The Stage or The Tea Tent as most of us know it! It meant I was witness to the endless stream of local talent that Hay and the surrounding areas seem to produce. The bar was undoubtedly raised this year with stellar performances each and every day.